The Audi Q7 SUV with a TDI engine featuring the world’s cleanest diesel technology reducing emissions of harmful nitrogen oxide by up to 90 per cent. At the 2009 Frankfurt Show Audi is exhibiting an A4 saloon benefiting from the same advanced technology. Audi is pioneering the introduction of the world’s cleanest diesel technology in Q7 SUV models that help to rid the air of Nitrogen Oxide (NOx ) emissions, regarded by many as being dramatically more harmful to humans than Carbon Dioxide (CO2 ). Capable of removing up to 90 per cent of NOx particles from exhaust gases, this ultra-low emission technology is being highlighted at the Frankfurt Motor Show, where it is being showcased in the compact executive A4 Saloon. 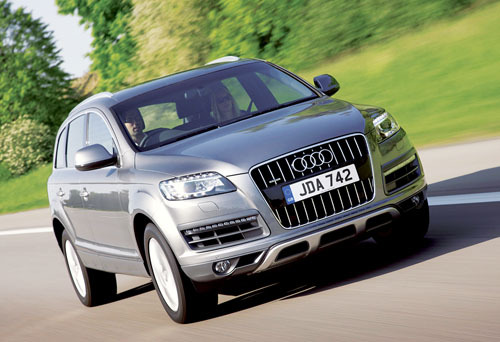 The Q7 3.0 TDI Clean Diesel is the first passenger car to be available with this advanced system, which has been designed to maximise engine efficiency and to optimise the after-treatment of exhaust gas. With its help, the 3.0-litre TDI engine powering the Q7, and showcased in the A4 in Frankfurt, already complies with proposed EU6 emissions limits that are not due to come into force in Europe until 2014. The core components of this ultra-low-emission system are a new common-rail injection system (which generates up to 2,000 bars of pressure ), innovative pressure sensors in the combustion chamber, and an especially high-performance exhaust recirculating system. Collectively these measures ensure a highly efficient and low-emission combustion process. In addition, an innovative DeNOX catalytic converter, or ‘NOx trap’, integrated within the exhaust system reduces residual nitrogen oxides, while just upstream of it a pump injects an aqueous solution called AdBlue into the hot exhaust flow, where it decomposes into ammonia. The ammonia then has the effect of splitting the nitrogen oxides into the inert gas nitrogen and into water. The use of clean diesel technology reduces the output of nitrogen oxide or NOx by up to 90 per cent. The suppression of NOx is widely regarded by experts as being as crucial to our wellbeing as the reduction of CO2 because on contact with sunlight it can form photochemical smog, a form of air pollution which can cause damage to lung tissue and a reduction in lung function.